Download Ceptah Bridge and install it. Open an existing Microsoft Project document. 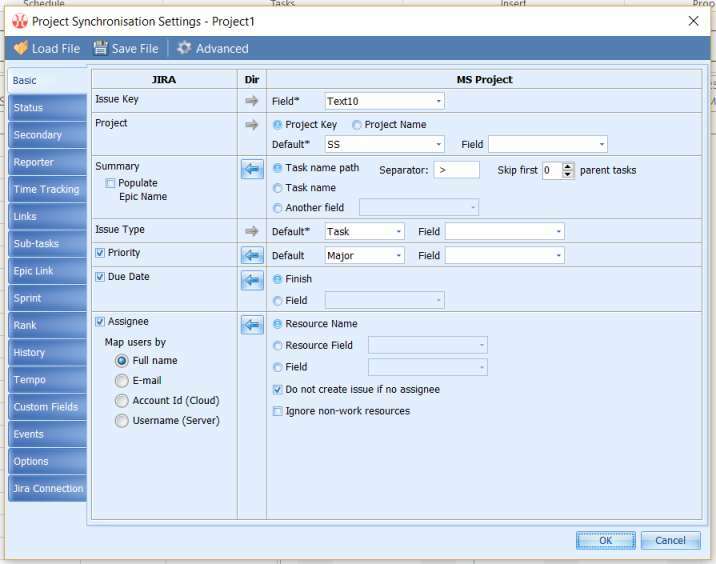 Click ADD-INS > JIRA > Synchronise in the ribbon or press Shift-Ctrl-S.
As there are no mappings between JIRA and Microsoft Project for the plan yet, the following message will appear. Press OK. Another message will be displayed. 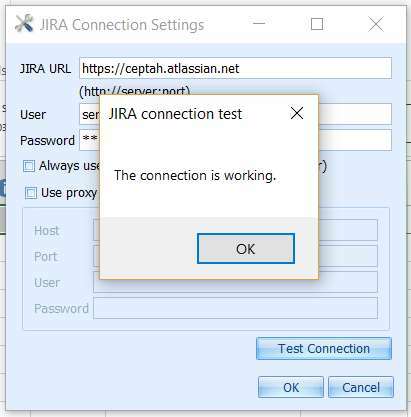 Enter your JIRA login and password. 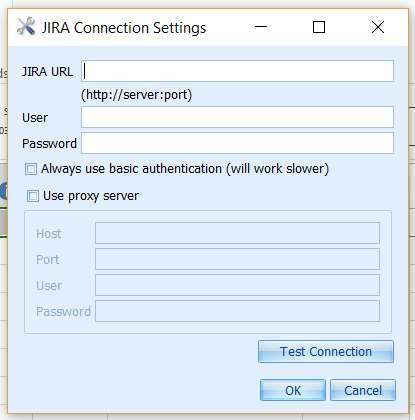 If you access JIRA through a proxy server, tick 'Use proxy server' and enter the proxy server parameters. Press 'Test Connection' to check the settings. Press 'OK' to save the settings. The Project Settings Dialog will appear. 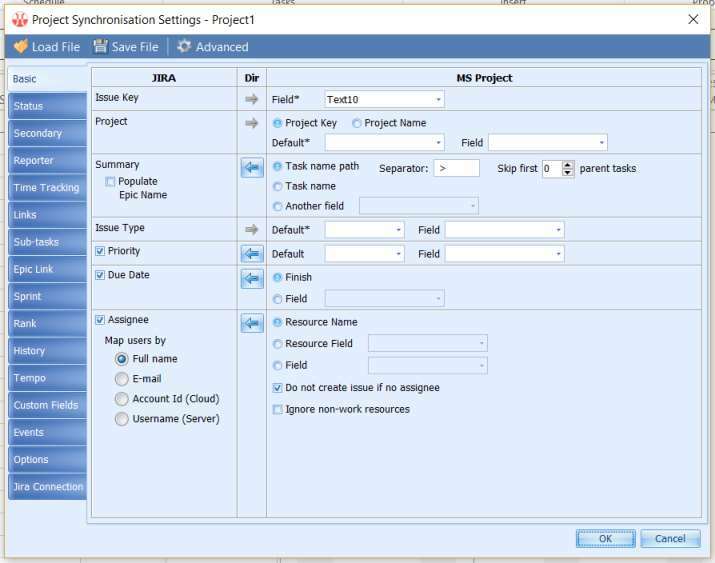 You will need to complete the mandatory fields marked with * to start basic synchronisation. Take notice of the Issue Key mapping. 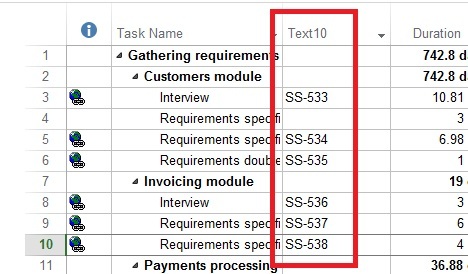 The keys of the linked issues for MS Project tasks will be stored in the Text10 field. That is how Ceptah Bridge knows which issue needs to be synchronised with a task. This field is populated automatically during import and during synchronisation as issues get created. 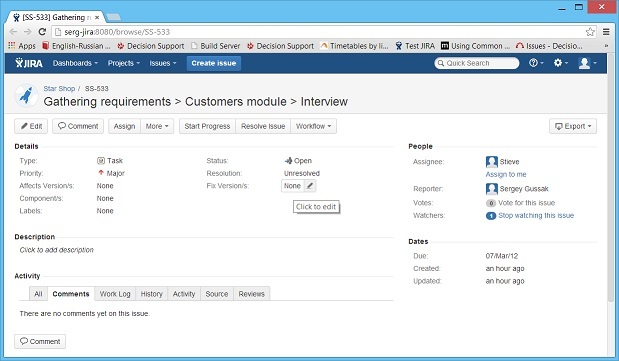 Select the JIRA project where issues will be created during synchronisation by default. A drop-down list with the keys of the JIRA projects available to you will open in the project settings dialog. 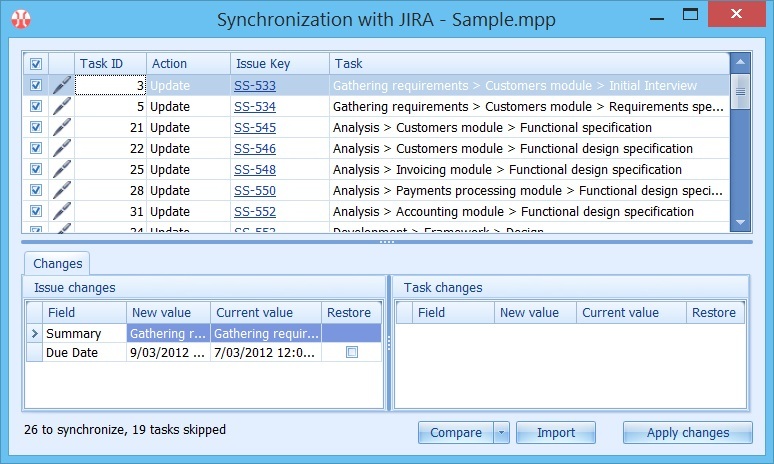 Issue Summary will be synchronised with Task Name. If the task is not on the first level, the names of the tasks it is part of will be added before the child task name and delimited with the '>' symbol. For instance, if there is a task called '2nd Phase' that has a sub-task called 'Regional Offices', which in its turn contains a task 'Deployment', the summary for the issue linked to 'Deployment' will be '2nd Phase > Regional Offices > Deployment'. 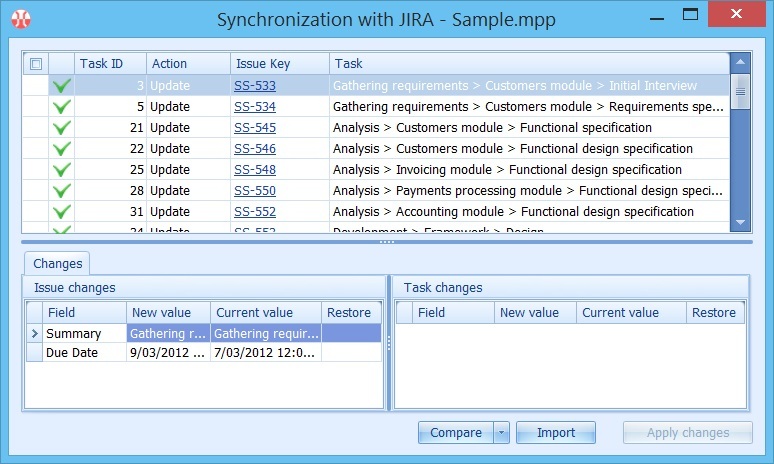 When a new issue is created during synchronisation, its summary will be set to the above described composite name. 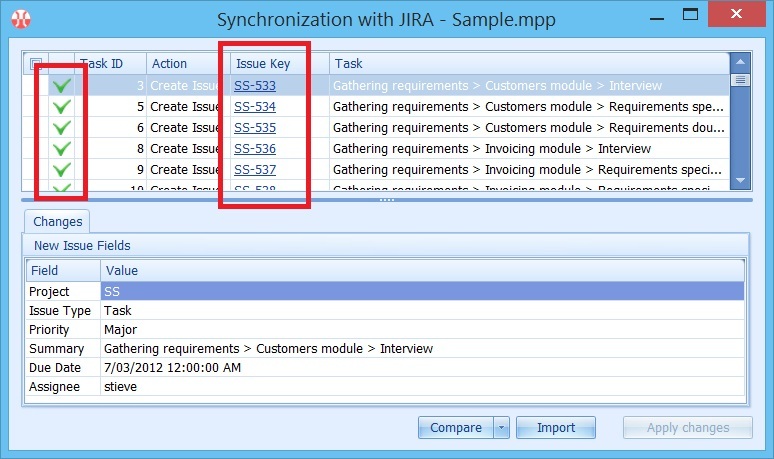 If a task has already been linked to an issue and the issue summary is different from the name composed using the task names, the summary will be reset to the latter value. The arrow on the direction button points from the side (MS Project or JIRA) that is the source of truth towards the side that should be updated during synchronisation if different. 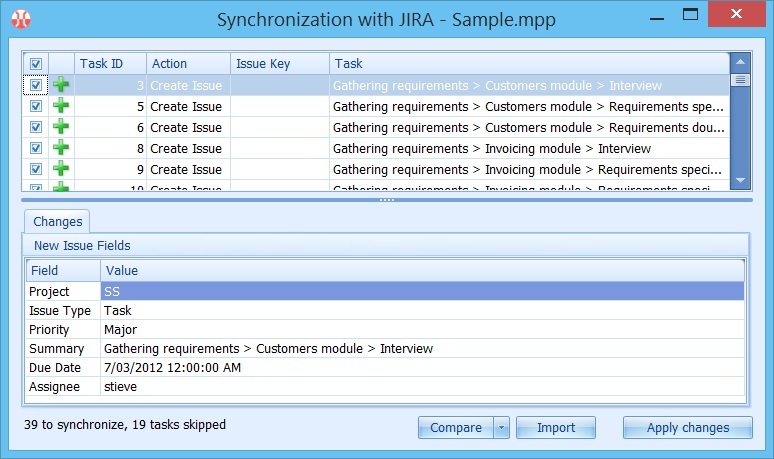 With the configuration in the picture, Summary in JIRA will be updated based on the MS Project task names if required. The direction, as well as other options, can be changed to tailor the mapping to your business process. The direction buttons are only regarded during synchronisation and only if the task is linked to an issue. Otherwise, which is when issues are imported or are being created, the direction button states are ignored. This applies to all mappings. Select the default type for new issues. Select the default priority for issues. Observe the Due Date mapping. Due date is mapped to Task Finish and will be reset to the Finish value during synchronisation because the arrow is pointing to JIRA. If you flipped the direction by clicking the button, Task Finish would be copied from Due Date instead. Assignee Name is mapped to Resource Name, and the direction is from MS Project to JIRA. 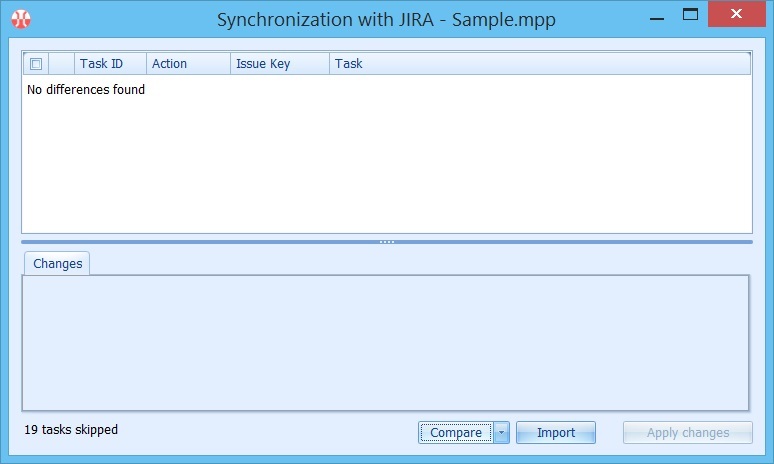 That means that the issue will be assigned (or reassigned) to the JIRA user whose full name is the same as the Resource Name for the synchronised task in MS Project. Note the fact that 'Do not create issue if no assignee' is ticked. Ceptah Bridge will not create issues for the tasks that have their Resources field blank. For the purpose of this tutorial, please make sure that the tasks that you want to be published in JIRA have their Resources field populated with valid JIRA user names as the tasks will not be synchronised otherwise. You have the minimum set of mappings configured now. As the synchronisation is about to begin and the product needs to be activated to run synchronisation, the activation window will pop up. 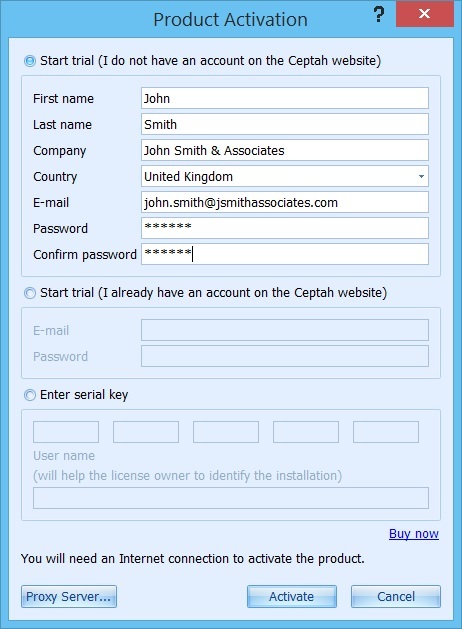 Complete the form and press Activate to continue. An Internet connection will be required for successful activation. Now Ceptah Bridge will go through the MS Project tasks and prepare a list of changes to be made. 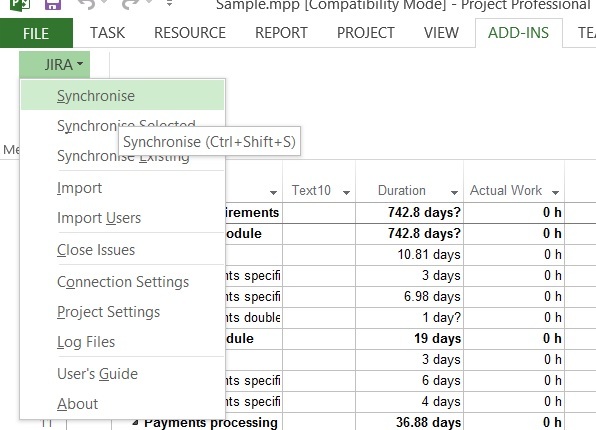 The top half of the window displays the tasks and/or issues that need to be updated or created during import or synchronisation. In our case it contains a list of issues to be created in JIRA. The bottom part provides a preview of the changes to be applied to each field of the item selected in the top list. Press 'Apply changes' to start the actual synchronisation. Ceptah Bridge will go through the prepared tasks, create issues and link them to the tasks by populating the Text10 field with issue keys. The synchronised items will be marked as done and a link to a newly created issue will be displayed for each row in the top list. Add the Text10 field to your current task view (e.g. Gantt Chart) in MS Project. Observe that Text10 contains the keys of the linked issues now. Ceptah Bridge populates the Hyperlink field with a link to the associated issue in JIRA. This is defined by the 'Hyperlink' mapping configurable on the 'Secondary' project settings tab. Click the link to open the related issue in JIRA. Change a few mapped fields in MS Project. Then run synchronisation again. Ceptah Bridge will suggest making some changes in JIRA to reflect the modifications on the Microsoft Project side. Press 'Apply Changes'. After the synchronisation finishes, you can open the issues in JIRA and see that they are in sync with tasks. Press 'Compare'. Ceptah Bridge will not find any differences as JIRA and MS Project are in sync now.